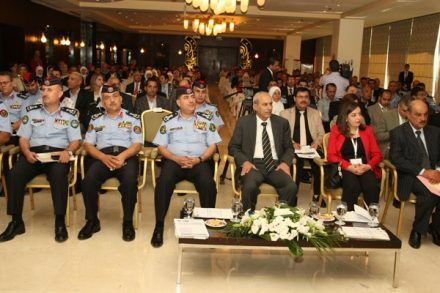 The First National Conference on Juvenile Justice “Justice for Children” organised by Penal Reform International MENA Office in cooperation with the Public Security Directorate / Juvenile Police Department took place on 20 and 21 August 2013. The event took place under the patronage of His Excellency Minister of Justice and Minister of State for Prime Ministry Affairs Dr. Ahmad Ziadat, with the participation of members from the Public Security Directorate , Ministry of Justice, Ministry of Social Development, and diplomats and government officials. During his opening statement, Mr. Mustafa Yaghi, Head of the Legal Committee of the House of Representatives, said that the juvenile law will be discussed during the next Parliament’s regular session scheduled to take place next October in preparation for its approval. PRI’s Regional Director in the Middle East and North Africa, Taghreed Jaber, welcomed the participants and affirmed the importance of the Juvenile Police Department,and the significant police role in dealing with children in conflict with the law. Given that the first contact that a young juvenile offender has with the juvenile justice system is with a police officer, the nature and circumstances of this police contact are likely to be significant and have a lasting impression on a young person. The police role is considered especially important, because young persons’ views and attitudes toward law enforcement are shaped by their first encounter. Ms. Jaber also commended the initiative of the Public Security Department to establish the Juvenile Police department naming it “the first in the Arab world” and added that although specialized police departments for dealing with juveniles exist in the region, this department and its structure in Jordan is the first such in the Arab region. She confirmed PRI’s commitment to expanding the scope of the new juvenile child-friendly police centers across the region, including PRI’s current unique experience in Yemen and Algeria. She also added that the main challenge to achieving a sensitive criminal justice system is the cooperation of all members of the society and in this regard, she praised the role of the Ministry of Justice and thanked H.E. the Minister of Justice for attending the conference and expressed her hope for establishing child-friendly courts for children involved in complex cases. Ms. Jaber also thanked Mr. Mustafa Yaghi, Head of the Legal Committee, for his support on the new draft juvenile law and expressed her hope for positive feedback and approval by the Jordanian parliament. On his part, Colonel Mahmoud Abu Jumma, Assistant for the Director for Judicial Affairs at Public Security said that First National Conference for Juvenile Justice is held in collaborative efforts between the Public Security Directorate and Penal Reform International to develop the juvenile justice system as well as improving the quality of institutional treatment of children in conflict with the law. Colonel Abu Jumma also highlighted that the perception of children in conflict with the law was changing and that they are no longer considered as ‘criminals’, and that their backgrounds and examining the factors behind their offending behaviour such as the the social, economical ,and psychological circumstances was now taken into account. He also expressed the Kingdom’s efforts in adopting several strategies and programs for reducing juvenile offending through the development of the legislation and adopting modern measures for dealing with children in conflict with the law and training of law enforcement and other relevant personnel to respond to the special needs of the young offenders and the use of alternative measures for the diversion of young persons from the justice system. PRI’s two-day conference aims to promote a restorative justice system in Jordan that ensures the best interest of the child, adopts modern mechanisms for dealing with young offenders, and implements social, psychological and after-care programs for the reintegration of juveniles in the society.